Objective: project is to develop innovative, fun foodstuffs made using algae extracts. Feasibility of molecular cuisine pilot scheme. The culinary world has been moving ever closer to that of chemistry over the past few years : one of today’s biggest trends is molecular cuisine, championed by chefs such as Ferran Adria (the chef at El Bulli) and Thierry Marx with their inventive, conceptual dishes. Through this project, the backers want to bring innovative products combining cuisine and chemistry to as many consumers as possible. Their goal was to develop an industrial manufacturing process for several products using the functional characteristics of algae (alginates and agar), while simultaneously assessing end user interest in these products. 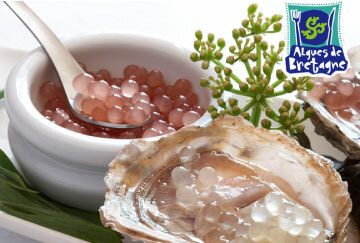 > Economic : “Perles de l’Océane” and “Perles de Saveur” were released as a result of the project – small gel beads with a liquid centre (30 items). > Scientific & Technological : The Gastralg project resulted in the development of an innovative industrial process produced by Fillpack, and a Soleau envelope has been submitted. The formulation and process conditions have been optimised with our technical centre partners, who have added their expertise in formulating products from alginates.